Workers at a car plant attempt to fight its imminent closure. In the wake of Brexit, those who oppose the European Union have been largely painted by the media as an uneducated horde of xenophobic fascists. Prior to that divisive referendum, opposition to the EU largely emanated from left wing, anti-capitalist sources who argued that the institution only had the interests of big business at heart. 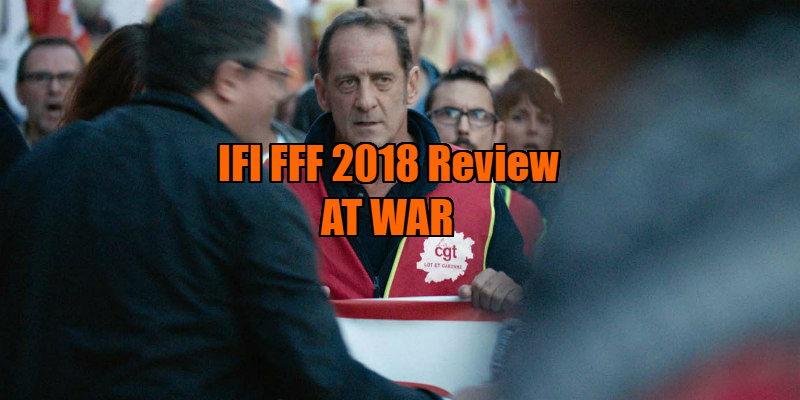 Director Stéphane Brizé's fourth collaboration with actor Vincent Lindon is a timely reminder that the socialist movement is as wary of the EU as their right wing opposition. As with the director and actor's last team-up, 2015's excellent The Measure of a Man, At War sees Lindon portray a working class man whose world is turned upside down by the loss of his livelihood. Here, Lindon is Laurent, a union leader at a car plant whose German owners are shutting it down and relocating production to Romania, where they can pay workers a fraction of French wages. Two years ago, the workers agreed to put in an extra five hours a week without payment, having been told this would ensure the plant's survival. Expected to continue working until the shutdown, Laurent and his co-workers go on strike and take their case to the French government, hitting brick walls of empty rhetoric at every turn. 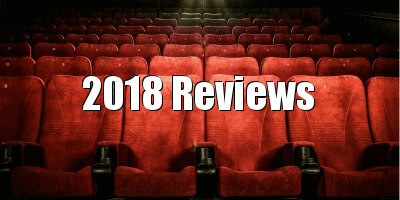 With much of the narrative gearing up towards Laurent getting into a face to face meeting with his company's German CEO, At War plays like a narrative riff on Michael Moore's debut documentary Roger and Me, in which the divisive documentarian similarly sought a sitdown with General Motors CEO Roger Smith following the shutdown of several car plants in Michigan. On the way, Laurent faces several obstacles in the form of lackeys forced to lie and cover for their overlord, who clearly has no interest in meeting the people whose lives his greed is impacting. Reasoned requests at regional offices turn into riots thanks to the patronising tone of the company's reps and the presence of heavily armed police doubling as a private security firm. 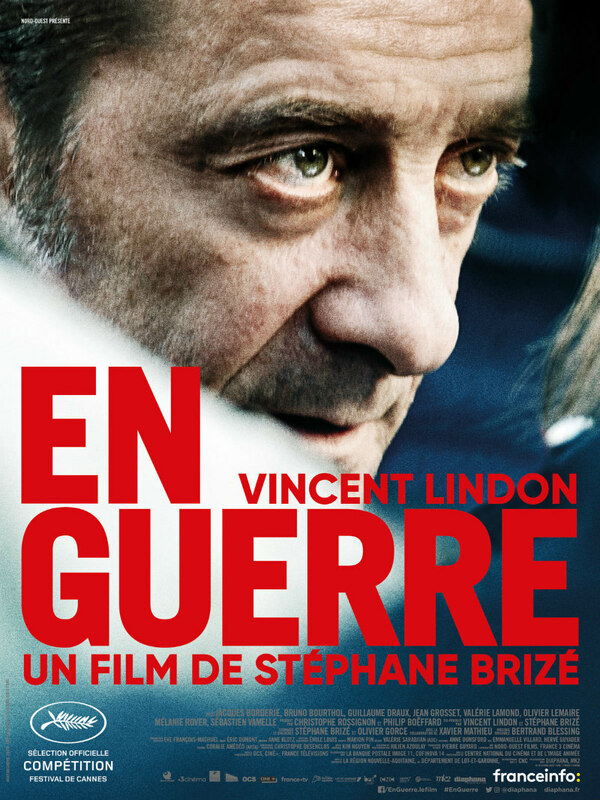 Focussing rigidly on the political scenario above any character drama, Brizé's film resembles a cross between Ken Loach's more politicised offerings and The Battle of Algiers, alternating between heated debates, which see the workers gradually turn on one another the longer their standoff stretches out, and scenes of demonstrations that regularly turn violent. Backed by Bertrand Blessing's propulsive score, the scenes of standoffs between workers and police are as thrilling and emotionally charged as anything in Mel Gibson's Braveheart. Late in life, Lindon has become France's most interesting actor, and perhaps its most under-appreciated, largely due to how easy he makes acting seem with his natural ease and wrinkled everyman charisma. Brizé shoots his film's substantial scenes in long unbroken takes, his camera hovering between shoulders like a child filming a schoolyard brawl on their phone, allowing us to really soak in just what great work Lindon and the supporting ensemble are doing here. Brizé doesn't tell us much about Laurent's life outside his principles, but I nevertheless felt I understood exactly who he is, which makes a scarcely credible late melodramatic act on his part feel like a gross narrative misstep. Unlike Loach's films, which too often come off as patronising portrayals of working class life designed to make middle class viewers feel better about themselves, Brize's political works are the real deal, recognisable to anyone who has spent time on the breadline, whether employed or not. With a rift developing in the plant workers between those who want to fight on and those willing to accept a derisory severance package, At War asks us how far we might be willing to go to ensure not just our own economic safety, but that of generations to come in the face of an increasingly globalised industrial landscape.